The Hollywood Foreign Press Association has announced their nominees for the 2018 Golden Globe Awards. The awards, which are for both film and television, include a couple of music related categories but, this year, one veteran artist has scored a nomination in the acting categories. Mary J. Blige is up for Best Supporting Actress for her performance in the film Mudbound. The movie is about two World War II veterans who return home to rural Mississippi to battle both racism and PTSD. Blige plays Florence Jackson, the mother of soldier Ronsel Jackson. Blige has been receiving accolades from a number of organizations for her performance including runner-up for Best Supporting Actress from the Los Angeles Film Critics and nominations in the same category for the Critics Choice and Satellite Awards. She has already won Breakthrough Performance at the Hollywood Film Awards and IndieWire Honors and was nominated for the Gotham Independent Film Awards. 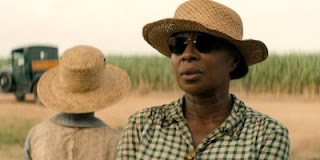 Blige is also nominated for Best Original Song From a Motion Picture for the song "Mighty River" from Mudbound which she wrote with Raphael Saadiq and Taura Stinson. Also nominated in the cateory is Mariah Carey for the song "The Star".